On the highway somewhat west of Rockhampton but a long way before turning down the road to Yalleroi, there was once a tiny outpost named rather inauspiciously, Banana. When one travels a little around this country, one soon develops a sense of the sort of agricultural produce that one can expect to be derived from the surrounding terrain, and it has to be said that the soil around Banana was rather underwhelmingly incompatible with any place we'd ever seen that produced the well known yellow fruit. Not even a person with absolutely zero knowledge of horticultural practice could mistake the area for one capable of supporting anything that even closely resembled its namesake. It's the sort of country that those who truly believe they live in a land of opportunity describe as prime grazing country, which when it all boils down, can be translated to meaning that it never rains, and when the grass does grows the land can support about one head of cattle per million acres. Less charitable people might even describe the landscape as verging on inhospitable. So it was no surprise to find that only part of the township of Banana visible from the highway comprised one single solitary shed with a couple of petrol bowsers outside and what appeared to be a mechanical workshop and some sort of office with a sign indicating that food was available somewhere within. It being food and petrol o'clock, we stopped to find a constantly ringing bell announcing our presence, and no other sign of life. Somewhere in the gloom that was the workshop part of the shed, a well dressed older gent emerged carrying a large spanner, and with a polite nod to us, commenced belting the electric bell with it, in what appeared to be an entirely futile request for it to desist in its constant clanging. I offered to assist, and grabbed a few tools of somewhat lesser dimension than his tractor spanner from my toolkit. As much through good luck as the application of a bit of common sense and logic, within a few minutes we had the miscreant device performing more or less as designed. The gentleman seemed to be eternally grateful and kindly offered us dinner at his roadhouse explaining with some obvious pride that was his first night in charge of the brand new business. Prior to that day, it seemed he'd been suffering badly on the land, through prolonged drought and depressed stock prices and he'd decided to give away cattle and try his hand at "business in town". We looked around, and seeing no sign of "town" presumed that this was it. At his urging we sat at a small table in the corner of the workshop that had been laid with a new seersucker tablecloth, and he asked us what we'd like for dinner. There was no sign of a menu, and we were a little unsure of our choices, so naturally we enquired at to what they may be. "Well", he began, almost puffing up to double his size in pride,"because it's our first night, Mum's got the whole menu on." We ordered steak, and in due course a table-sized slab arrived on a monster plate, dripping in fresh fat and cooked as only a cattleman's Mum could cook it. Eating the lot was no mean feat, but it gave plenty of time for conversation and in the course of dinner the mystery of the naming of the town was solved. Banana it seemed was the name of a particularly large and meaningful bullock which led a haulage team in the days before road transport had been invented. After a long and arduous life of giving his all, poor old Banana succumbed to the effort of hauling a load out of a gully nearby, and it subsequently became known as Banana's Gully. In the almost forty years since my visit, Banana has become the centre of its own self named mini mega Shire, in the middle of a booming resource-fueled regional economy, I suspect the shed is now larger, and the spanners in the workshop are larger still to cope with the size of machinery that is now scattered through the area, and maybe those steaks will have been replaced by burgers from an international franchise, and the bell will have long been gone. 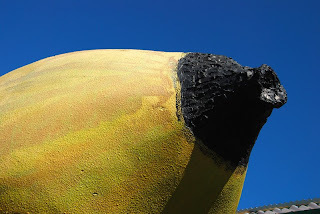 No matter how large may have become, I must confess that to this day I can't look at a piece of that bent yellow fruit without having a passing thought for Banana's Gully" and wondering what happened to the bloke who gave us the choice of the full menu.